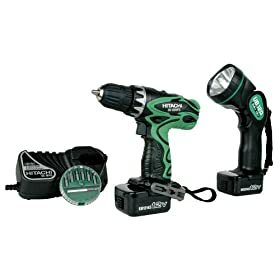 DS12DVF3, 12V, Cordless, Drill, Has Been Designed To Meet The Need For A Compact, Lightweight Drill That Has The Power & Durability To Stand Up To Tough Jobs, With Features Such As A 2 Speed Transmission, 22 Position Clutch Setting, Comfortable Non Slip Grip, 5 Position Belt Hook & 1.4AH Batteries, Features Include: Compact & Lightweight, Only 7.75" In Length & 3.3 LBS, Class Leading 230 INLBS Of Torque To Power Through The Toughest Jobs, 1.4AH Batteries Allow For Longer Run Time & Fewer Battery Charges, 22 Stage Clutch For High Torque And/Or Precision Driving, Convenient 5 Position Belt Hook Features An Integrated Bit Holder, 2 Speed Transmission & Variable Speed Switch Allow For Ultimate Speed Control, Soft, Non Slip Elastomer Grip For Increased User Comfort. I spent a lot of time researching a light-weight drill to use for my small duty tasks and projects. 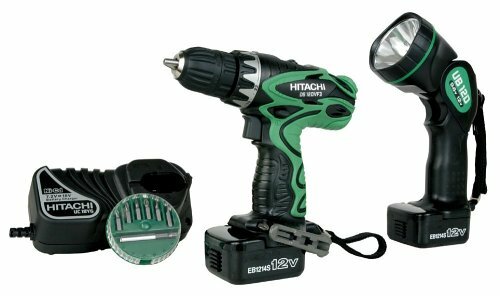 The Hitachi 12v fit the bill perfectly. I teach school and have my summers off. I've put a lot of time and money over the last four summers into an addition, a new kitchen, and a new bathroom that I've done most of by myself. I've been using my 18v Makita for everything and it has never failed, but I have always cursed the thing when working in tight quarters or above my head for long periods of time (ceiling fans and drywalling ceilings). I finally decided that a lighter drill was necessary and I debated over getting a big cordless screwdriver (Dewalt, Ridgid, Bosch "Pocket Driver")or a small drill. After comparing many brands, I found the Hitachi to be the most powerful drill for its' size and price: 230lbs torque and 3.5lbs in weight. It is also nice to have a chuck and not a hex head. At $80 it's hard to beat, and it comes with a flashlight. The Dewalt (80lb torque) and Ridgid (100lb torque) screwdrivers are the most powerful, but their weight is the same as the Hitachi 12v drill. The super-light Bosch was very tempting but I was afraid that it would be underpowered. I know that cordless screwdrivers and 12v drills are not the same, but seriously consider your needs and power requirements and you might just find as I did: this drill is the perfect tool to bridge cordless screwdrivers and drills (run-on sentence). I have two of these drills now. The first was originally purchased for use at my lake home. I also had a Dewalt 14.4 that I lugged back and forth, just in case I needed to do anything heavier duty. It turns out, this little drill can go head to head with that Dewalt, and now I much prefer it over the bigger and heavier Dewalt. (The Dewalt was 3 or 4 times more expensive originally as well). What surprises me about the Hitachi is the torque it has. Its fortunate that it has such a good adjustable clutch because this little thing has the power to twist off screw heads if you're not careful. Amazing for such a light and handy drill. The trigger has a great feel to it as well. One can feather it on and off to screw in something delicate and it responds exactly as you would expect. It doesn't keep spinning like the Dewalt tends to. I ended up buying the second drill for home here, and leaving the Dewalt up at the cabin "just in case". The Hitachi is the first one I reach for now. If Hitachi is listening, my only disappointment in this drill is the lack of two bit holders. The Dewalt gives me storage for a flat bit, a phillips and a square drive. With the Hitachi, I've had to leave the flat bit in the shop. Also, the bit holder that is there isn't very reliable. If you drop the drill, you better check the ground and make sure your second bit isn't laying there. But this isn't a show stopper. Also, the magnetic bit holder included with the kit remains in the shop as well. If you use something like this primarily wandering around outside your shop (as I do up at the lake), you'll almost certainly want a quick change bit holder with a more positive action to it (Dewalt's are VERY good). If you rely on the Hitachi bit holder, you'll lose bits. The bit holder plus a bit is also way too long to feel like you can get any leverage with it. I never use the flashlight, so can't really comment on it. I also don't use it all day every day, so can't really comment on battery life. It always seems to have enough juice when I need it. If not, the battery is quick to change, and doesn't "stick" like the Dewalt tends to do. All in all, I would definitely recommend this drill. I think it is one of the best bargains for the price. I have a Hitachi reciprocating saw as well that I really like, and will give Hitachi a shot for my other tools as they wear out and need replacing. The drill works well, the extra battery is great and the charger goes to trickle charge when the battery is charged so it does not overheat it. I like the drill. This drill is light weight, yet very powerful. When you have to hold a drill all day, you want to make sure it's as light as possible and the battery lasts. The fact that it recharges in 30 minutes is another great feature. Highly recommended. Very honest gentleman at the store recommended this drill and i got it thinking i'd use it around the house. drilled a couple holes here and there but when i took it to a job site it couldn't stand up to the ryobi or the dewalt out there. after only about 20 deck screws it started smoking a little from the vents near the back. maybe it was because it was still really new, and others on here have said theirs had plenty of torque, but this guy didn't do it for me (especially on the high speed/low torque position) and the high speed could be higher as well. so again, around the house is probably fine. very light weight, quick charge. Very satisfied so far with this light weight drill. Easy to handle and good power. I agree with the person that has had chuck problems. This drill is a nice all around drill for average every day tasks but the chuck is extremely annoying. I am constantly trying to tighten the chuck and it still falls out on occasion. If it wasn't for this weak spot the drill would be a five star product. It is small and light and that's the best part. I can get into tight spots where my Dewalt doesn't fit. It comes with 2 batterys but I find has enough power for most jobs. I like the flashlite too. Really nice and bright. My toughest decision when shopping for this drill was whether to get this Hitachi or a DeWalt. Let me say that so far, I am not disappointed in the least. This little bugger is powerful, well-balanced, extremely compact, and a pleasure to use. I wasn't excited about the light, but it has been a real helper, too. This is a great drill at a great price. The drill has great torque and is much better at preserving screw heads than any B&D I've ever used. The flashlight is good too, although not as strong as a comparable sized led lamp. Overall the batteries charge fast, the cradle has an indicator, and it's always been there for me between charges when I've needed it. Good buy for home fixes. Great lightweight drill for hardware install's & buying a second package is cheaper then buying 2 extra "backup" batteries. Never thought I'd have much use for the flashlight but was wrong; for inside cabinets, closets & under sink work, the light is perfect. I purchased the Hitachi 12Volt drill after my Dewalt 9.6V bit the dust. The latter was old, awkward and had a broken chuck collar so I was happy to see it go. The Hitachi is light and has reasonable toque. It is well balanced and stable standing on its battery pack. I use it in tandem with my Panasonic 12V, probably the best rechargeable drill I've ever purchased. The Hitachi gets the basics done and I have no complaints after 1 month of use.